Update - Salt Water Sandals' delicious limited edition cherry print! 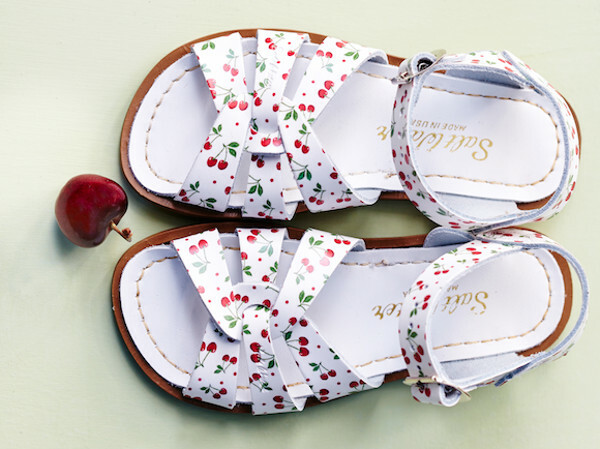 Update – Salt Water Sandals’ delicious limited edition cherry print! Those gorgeous summer staples, Salt Water Sandals, have just been given a sweet twist. This year’s tasty limited edition print will have your kids begging for a pair – pretty please with a cherry on top! And guess what – these are available in adult sizes too. Each year heading into the holiday season, Salt Water Sandals give us an early Christmas present – limited edition prints. And if you’re a lover of fashion with a fruity flavour, this year’s Cherry Print Salties belong on your feet! As with each pair of Salt Water Sandals, the limited editions are made from super supple leather that allow for happy little feet during the hottest of hot days. The new Cherry Print Salt Water Sandals are in stores now, from infant through to adult sizes, and they’re available as Originals, Sweethearts and See Wees. However, being a limited edition print, there is limited stock and sizes, so you’d best rush in and snap up these sublime sandals while the picking is cherry ripe!